As for the second question, yes there were not-sure regions (Euclidean score 60~70) where the face recognition(FR) had trouble giving correct results. Therefore, I previously skipped these frames completely, due to the inference is a video, and I have many frames of face images to use. In short, Euclidean score below 60 was set as "Unconfidence" where the inference face is labeled "Unknown" (Unknown means not enrolled in database). In contrast, Euclidean score above 70 will be labeled as the enrolled name in database e.g. "WILL". For Euclidean score between 60~70, false results will occur, i.e. the FR will think it's someone else "John" when it's actually "WILL". But all these measures are just a work around for Euclidean score, as the SVM score now can give a more definite "-1" as different faces and "+1" as same faces between inference and enrolled. I guess you can say high varianced SVM score (I normalized from -1~1 to 0.00~1.00) is better in FR application, due to differ the "higher known confidence" and "lower unknown Unconfidence". @Tsay Joy Hi Joy, I use formula Probability=sqrt(1.- Euclidean distance), also this is not real probability, but probability-like value. Actually,in this way I de-linearize output value. Due to the changed slope of the function I get stretched scores near 0. and shrinked where Euclidean distance coming to 1. Don't you think, your SVM does something like this? Thank you for providing this great library! I would like to speed up the inference step of the network on the CPU by using Intel's OpenVino framework. To do this I would first need to convert your network into a format that the OpenVino model optimizer understands (e.g. Caffe). I have tried to use your "convert_dlib_nets_to_caffe" tool, but I ran into a problem. Any suggestions on howto fix this? It would be great if we can make your network run on the new Intel Movidius Neural Compute Stick 2. I'm attempting to use dnn_metric_learning_on_images_ex on multiple (4) GPUs for the first time. After much playing with the batch size and the number of data_loader threads, I can't seem to get the typical GPU usage to above ~30%. Any suggestions of what I should be looking at / modifying to keep the GPUs occupied? Thanks! The network in that example is probably too small to benefit from 4 GPUs. you recommended the use of an SVM classifier after the DNN ("I would use http://dlib.net/ml.html#svm_c_linear_dcd_trainer"). The stated performance of 99.38% on the standard Labeled Faces in the Wild benchmark is achieved using the pure DNN with Euclidean distance measure and without any VCM behind it, correct? Right, the 99.38% accuracy is without any additional training applied. It's using just the DNN model by itself. do you publish the code used for the Labeled Faces in the Wild benchmark in order for us to duplicate the result? My dataset has 3M people with 60 images per person, Do I need to change the following numbers in code,Do you think the numbers seem to be reasonable? Does these numbers related to batch size(which is 128 by default)? is referring to in your code. I am running "dnn_metric_learning_on_images_ex.cpp" file in dlib/examples. Those numbers are fine, the bigger the better usually, as long as your hardware has enough RAM to support such sizes. You should run experiments to see what works best though. 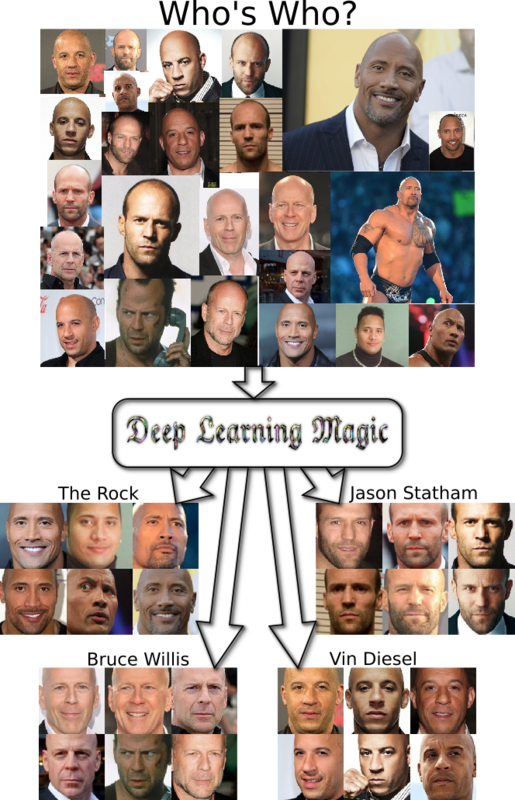 I'm training my own face recognition model, testing different architectures and loss functions, and comparing them with pre-built models like yours. I came into the comment of your loss function << a structured metric loss that tries to project all the identities into non-overlapping balls of radius 0.6. The loss is basically a type of pair-wise hinge loss that runs over all pairs in a mini-batch and includes hard-negative mining at the mini-batch level >>, and I wonder what do you think of it when compared with the triplet-loss (or more recent ones such as https://arxiv.org/pdf/1801.07698.pdf), and if you had the time to empirically compare them. Thanks ! I think it makes more sense than the triplet loss. I'm not sure how it compares to the other recent losses. I think sphereloss is sensible and basically motivated the same way. Really though you should optimize a loss that measures the performance of the model on the task you want to accomplish. The loss I used here in dlib optimizes the binary classification accuracy when using Euclidean distance between vectors to decide if pairs of faces are the same person. Other losses will be more appropriate for other tasks. It should also be noted though that the quality and size of your training dataset is far and away the most important variable in making a good face recognition model. All your effort should be on that. Other things are micro optimizations. You can also always call deserialize(some_object, some_input_stream). So you just have to make an input stream with the data in it. There are many ways to do this. std::istream in(&sbuf); // where sbuf is streambuf. So, how do I gt this 'some_object'? deserialize(some_object, in); // <-- where and how do I define this 'some_object'? Thank you for your last explanation about the loss used by dlib. For the sake of completeness, I would have some other questions. Regarding the creation of the mini-batchs at training time, do you specify a number minimum of images per class (person) ? For instance, if the size of the mini-batch is 32, and I want minimum 4 images per person, I would have at most 8 different persons in that mini-batch ? Firstly, I really thank you about amazing library. I am fine-tuning the model "dlib_face_recognition_resnet_model_v1.dat" based on your code from file "dnn_metric_learning_on_images_ex.cpp"
Could you please give me some advice about this problem? Thank you so much, it's really helpful for me. What is the best way to represent the 128D face vec (std::vector>) in a manner that it could be stored on sql db. And I wonder if it possible to run the face resnet on CPU only without GPU acceleration?